In the Aug/Sept 2012 of Catholic Digest, Mary Lou Quinlan wrote a touching article on her mother's "God Box." Like many of us, her mother had lots to pray for. Quinlan writes, "With a growing list of wishes and worries on her willing shoulders, Mom decided to adopt the idea of a God Box to lighten her heart. She'd grab any handy scrap of paper . 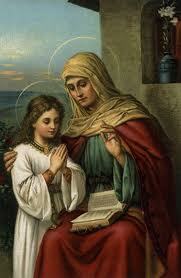 . . date it, write 'Dear God,' describe her need, sign it 'Love, Mary,' place it safe inside her God Box, and let it go." After her death, Quinlan found ten of these God Boxes up in her closet with petitions covering over twenty years. "We were overwhelmed to see how often she took our cares to God. It was like being wrapped in her arms all over again." She also always put God's will before her own, adding, "if You think it's right" to her notes. I think that this is a beautiful idea. I know so many people need and ask for prayers and I do try to honor every request, even if it is only a quick Hail Mary when I read a Facebook post or think of someone who needs help during the day. And I hope others do the same for me! It can be hard to keep track of all the requests, however, and I feel badly when I hear about something bad happening to someone and then I remember, "I promised to pray for that person, but then I forgot in the busyness of life." I have heard of people keeping lists of those who need prayer and then they pray for those "on their list." In some ways, this is a similar idea. However we do it, we need to turn our prayer requests over to God. A "God Box" is a wonderful thing to have. We all struggle with battling temptations - every day. Each of us has our own areas of weakness. This article by Maurice Blumberg offers some good advice on how to fight temptation and win: Winning the Battle Against Temptation. Procrastinators will like this one: Put off till later the evil that you can do right now. Tempted to fritter away your work or study time play­ing video games or surfing the Web or watching some garbage” on TV? Just tell yourself that you’ll play or surf or watch it later. Then when “later” comes, repeat the process. 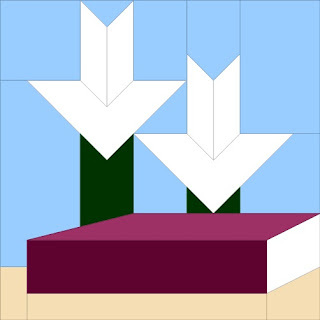 Do you feel like giving in to self-pity or an angry tirade? Put it off, and give yourself a chance to accept the grace to put it off again. Make procrastination your friend, and use it as a tool for perse­vering toward the good. I am not much of a gardener - truly, I am amazed when anything I plant grows. But, this summer I have had great success with my wildflower garden. It has been blooming all summer long, surprising me with new flowers and different colors and it always makes me smile. Hope you enjoy the virtual blossoms! Back in July 2011, I was approached by Lisa Hendey of CatholicMom.com and Ave Maria Press and asked to write "The Catholic Baby Name Book." I spent the next nine months working frantically on it - truly, it was only through the grace of God that this project got completed - and turned in the completed files in May of this year. I was hesitant to say anything about the book in case the project didn't go through, but here it is in black and white in Ave Maria Press' latest press release, so I'm sharing the good news! I'm honored to be in the company of the other wonderful writers asked to be part of this series. My book won't be coming out until some time in the spring of 2013, but when it does, I hope it will prove to be a useful resource for those choosing a name for a child as well as a resource on saints. It includes over 10,000 names and 3000 short saint biographies. There is a patron saint in there for everyone! I will share more info on the upcoming publication when I have it. Building on the popularity of Lisa M. Hendey’s The Handbook for Catholic Moms and A Book of Saints for Catholic Moms and her award-winning website CatholicMom.com, Ave Maria Press is pleased to announce the launch of CatholicMom.com Books, which will take place at this week’s Catholic Marketing Network tradeshow in Arlington, Texas. Ave Maria Press’s CatholicMom.com Books will include 1-2 books per year, starting in September 2012 with A Catholic Mother’s Companion to Pregnancy by popular blogger and author Sarah Reinhard. 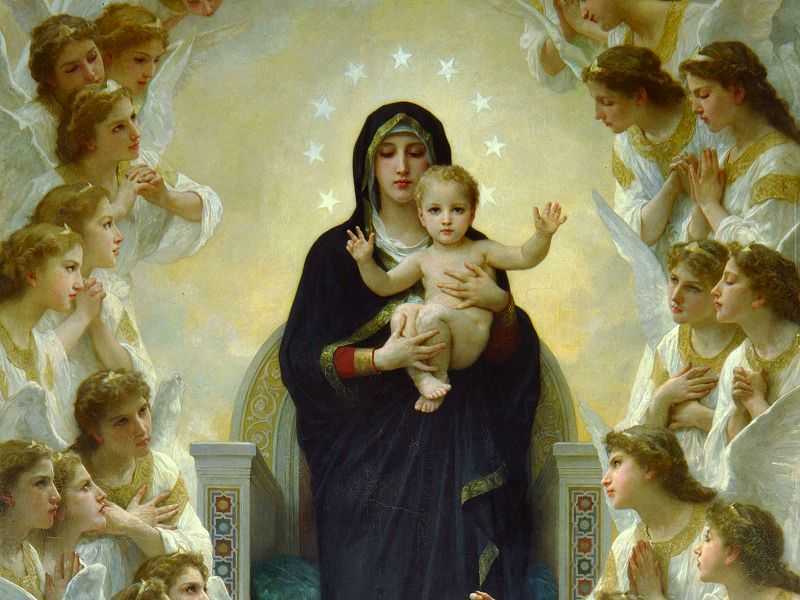 Reinhard’s book accompanies expectant mothers from conception to baptism with weekly reflections and prayers rooted in the mysteries of the Rosary. Due out in 2013 will be a book of Catholic baby names by Patrice Fagnant-MacArthur and one by Marge Fenelon on eight Marian virtues for motherhood. Hendey will play an active role in selecting new authors and books for this exciting new series, contributing a foreword for each title and promoting the books on her site and through the thousands who follow her on social media networks. I don’t often reread books. As a book reviewer, I always seem to have more good books in my “to be read” pile than I could ever have time for. Therefore, for me to read a book twice, it really needs to be something extraordinary and helpful to my life. A Little Way of Homeschooling by Suzie Andres definitely falls into that category. On Monday, my two boys and I will begin our fifth year of homeschooling and I recently found myself compelled to once again find refuge and renewed courage in the shared wisdom of those who share their stories within its pages. I am not a true unschooler. I have relaxed quite a bit in five years, but as much as the unschooling lifestyle appeals to me, I can’t let go to that extent. Yet, that is the beauty of A Little Way of Homeschooling – one need not be an unschooler to appreciate and benefit from the encouragement of this book. Andres, who is a graduate of St. Thomas Aquinas College and who holds an M.A. 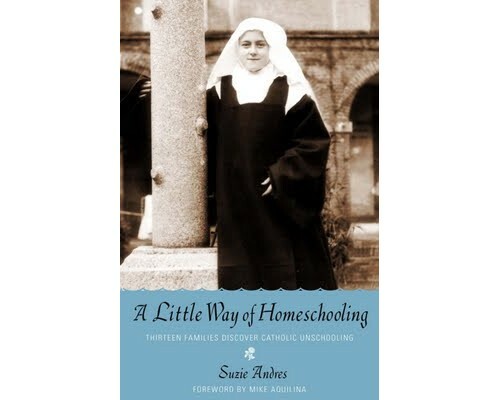 in Philiosophy from Notre Dame, became known as an expert in Catholic unschooling after writing Homeschooling with Gentleness, in which she chronicled her own journey towards unschooling and explored how a Catholic could unschool and still be in keeping with Church teaching. In A Little Way of Homeschooling, Andres asked other Catholic families to share their experience of unschooling. All of their stories are informative and inspirational. The first nine families profiled are true unschoolers. The remaining four "integrate elements of unschooling with more formal approaches to learning." The beauty of homeschooling is that we get to do what works for us. Sometimes that means a carefully crafted plan. Other times, it means letting go of the plan to see where our days take us. Unschooling doesn’t necessarily mean there’s never a structured lesson, or never anything that looks like school, though it often means that. It doesn’t mean we’ll never touch a textbook or do a worksheet. If those things help, and learning happens, we sometimes do them. What unschooling means to me is that we needn’t adhere to a model of school that doesn’t serve us. Isn’t it true that most of us get into homeschooling because, for whatever reason, the traditional “model of school” didn’t serve our children well? In educating our children at home, we have the opportunity and responsibility to find a model that does work, or at least works reasonably well, for our individual children. What I appreciate most about this book is that, unlike many books on homeschooling, it doesn’t present a “perfect” picture of homeschooling. Those types of homeschooling books were very helpful to me when I was starting homeschooling and dreaming of all it could be. Five years in, I find I can’t even read those books anymore because comparing myself to those families makes me want to crawl under the covers and never come out! A Little Way of Homeschooing is a book for those in the homeschooling trenches, sharing the stories of other mothers who have messy homes and children who don’t necessarily wake up in the morning eager to embark on an exciting new day of learning at home. Andres encourages us to "Trust God and be gentle with ourselves. . . What is learned and achieved is extremely individual to the child - and directed by God. Parents and teachers can assist, but they are not the ones primarily in charge." That is such an important thing for each of us homeschoolers to remember. I plan to make reading A Little Way of Homeschooling an annual event in my homeschooling life. In the "It's a Small World" category, I grew up across the street from Dianne Murphy's in-laws and met her when we went to art school together. She was a mother of a large family, who was doing something for herself by going back to school. And then, when I started homeschooling, I became friends with her daughter Mary who is an amazing woman and at the time was the head of our local Catholic homeschool group. 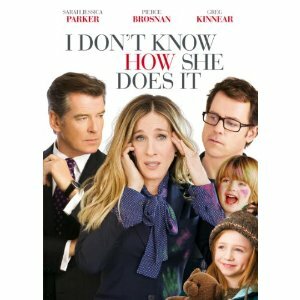 Movie Review: I Don't Know How She Does It! I recently had the opportunity to watch I Don't Know How She Does It , a movie starring Sarah Jessica Parker as a working mother trying desperately to keep all the balls in the air at one time. I really enjoyed this movie - it was very funny, and with the exception of a couple lines of sexual innuendo, very clean. It also had some important things to say about motherhood and had a pro-life component. Parker's character has a very high-profile job in finance that requires her to travel, often at short notice. Her children are well-cared-for by their nanny and she has an involved husband, but she still feels the pain of missing out on key moments. In addition, her five-year old daughter resents her absence a great deal. Try as she might, work-life balance isn't working at all. There are many parts in this movie that all mothers can relate to. Whether you work outside the home or not, there are always schedules to juggle and too much to do. Parker has lists everywhere, especially in her mind - they keep her awake at night as she tries to figure out how she will do it all, while her husband, of course, sleeps peacefully. Men just don't seem to suffer from these issues, do they? In the end, the stress of the job and her family is tearing her apart, and she issues an ultimatum to her boss. As for the pro-life component, her assistant finds herself unexpectedly pregnant and plans to have an abortion. Parker talks her out of it, and offers her help and advice on how to be a working mom. The only negative I found in this movie was that the stay-at-home moms were portrayed in a very stereotypical manner. They were the "mean moms" who excelled at all things mother-related, passed judgment on the working mom, and spent their days doing nothing. Although, truly, the portrayal was so stereotypical, I really do think that it was meant to be funny, and it was. If you are looking for some fun movie viewing, "I Don't Know How She Does It" should be added to your list. 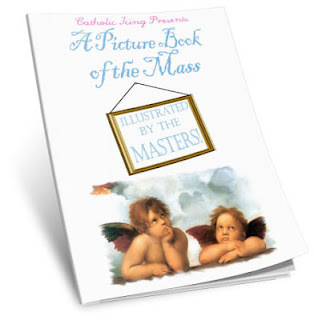 The National Catholic Register featured A Picture Book of the Mass Illustrated by the Masters in a recent article: Mom Makes Kids' Mass Book. Rabideau combines the beauty of fine art with the text of the Mass in her new book. Each illustration includes the title and artist’s name, and icons accompany the text, indicating the appropriate posture at different points of the Mass. 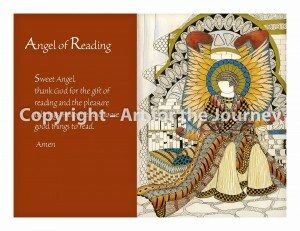 Illustrations include works by Fra Angelico, Bloch and Bouguereau, among others. Striking images draw the reader into the rich meaning of the different parts of the Mass, offering an effective focus for the wandering mind and an opportunity for meditation on the mystery at hand. . . I'm trying to keep an open mind about my children's career choices. I know that God has given them a certain tool set of gifts and I pray with them every day that they grow up to be the people that God wants them to be, that they have the career and vocation that they should. I recently came across this helpful article in St. Anthony Messenger: When I Grow Up on helping your teens make good career choices and supporting them in those choices. Catholic parents should recognize that every legitimate job is a divine calling. Each person in whatever job he or she may choose can be part of God's work for accomplishing the world's daily tasks. In making career decisions, teens need help, not control, from their parents.
. . . The college major or job chosen may not meet with your approval. It may even throw a monkey wrench into all the plans you had for your child. But remember, God works in his own way to call people into many different fields of work. "Plans fail when there is no counsel, but they succeed when counselors are many" (Prv 15:22). If you keep open the lines of communication, then living with your child's decisions will become easier for both of you. And, in the final analysis, God's plan for your teenager's life will ultimately unveil itself. 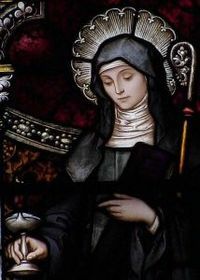 Most of us are aware of the "famous" saints - people such as the Apostles, St. Francis, St. Therese, St. Anthony, etc., but there are a huge number of saints that very few people know anything about. 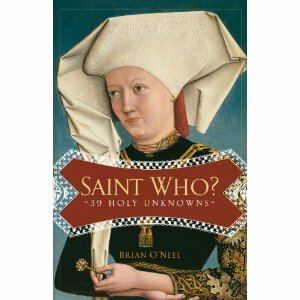 Brian O'Neel sets out to rectify that (at least a little bit) by profiling thirty-nine little-known saints that have something relevant to teach us today in "Saint Who? 39 Holy Unknowns." For each saint, O'Neel offers a brief biography along with a reason why oneshould pay attention to this saint. In these pages, one learns about Saints Perpetua and Felicity and discovers that no reason for living is worth denying Christ. St. Bathilde, the wife of King Clovis, teaches us how to use power and possessions for good. St. Willichord, a missionary saint, offers lessons in perseverance in the face of failure, and St. Lydwine demonstrates faith and patience in the midst of tremendous physical suffering. Perhaps the most valuable lesson is that "Each if us has abilities we can use for God. Whether it be working on our personal sanctity or trying to make this world a better place by preaching the gospel, each of us can do something that will leave a mark. It's not too late. You're still breathing. What is God calling you to do?" Each of us is called to be a saint. In "Saint Who?" Brian O'Neel educates us about thirty-nine people who did. They are worth spending some time with. Discernment - What is God's Will for Me? "What is God's Will for Me?" - That is one of those questions that we ask ourselves so often. The issue of discernment - where God's will and our free will intersect - is a big one. We want to make good choices and do what God wants for us, but sometimes it is so hard to tell. Joseph Pronechen explores the subject in his recent article for the National Catholic Register: What is God's Will for Me? If we’re still not sure, seek answers from the Bible and Church teaching. Jesuit Father Mitch Pacwa, host of EWTN Live and author of How to Listen When God Is Speaking: A Guide for Modern-Day Catholics (The Word Among Us Press, 2011), explains this method. “The first and most basic principle is that a person needs to have enough humility to accept God on his own terms,” he says. That means accepting what the Lord has revealed about himself in Scripture, Tradition and the magisterium. “Discernment comes into play quite legitimately when you have two options, both of which are good in and of themselves,” Father Pacwa adds. For instance, discovering what state in life one is called to: priesthood, married life or religious life. Two attitudes help us better able to discern God’s will, Father Pacwa says. “One: What is for the greater glory of God? How am I going to give him better service and greater glory in my life? Two: being truly equal-minded toward all good things.” This means wanting to do whatever God wants because I trust that he has the greatest good for me involved in that. One of the blogs I follow is written by a college classmate who has two "typical" teenagers and a pre-teen child with severe special needs. I'm friends with her on Facebook and I am constantly amazed by her faith and fortitude and daily struggle. Her daughter is currently in the hospital again and she has written a powerful blog post about the difficulties inherent in that, not only for her daughter who is sick, but for the family as a whole. I invite you to read her blogpost here: Loneliness and perhaps say a prayer or two for her and her family. I'm sure that they could use it. I'm pleased to present the latest in my patron saint quilt series. This block is in honor of St. Anne, the mother of Mary and grandmother of Jesus. Heaven is for Real: A Little Boy's Astounding Story of His Trip to Heaven and Back has been on my "want to read" list for a while now and I'm pleased I recently had the opportunity to spend time with this true-life story. I believe in heaven - I don't need a book to tell me that it is real, but I like to hear stories about people who have been to the other side and come back to share. I think God allows us to get those little glimpses because He knows we are a naturally skeptical people, especially when it comes to things we can't see or touch. Todd Burpo is a Wesleyan Pastor who was very respectful of Catholicism within these pages. He tells the story of his son Colton's experience on the other side. What makes this so remarkable and believable is that Colton was only four years old. He couldn't have made this stuff up, and the theology coming out of a young boy's mouth would have made anyone take notice. He also suddenly had information about his great-grandfather who had died before he was born, and about his sister, a child lost before birth that he had never been told about. He had met both of these people on the other side. Honestly, I don't know what heaven is like or if everyone experiences it the same way. Young Colton Burpo saw a heaven that was very consistent with what is told in the Book of Revelation and in other parts of Scripture. Some of it was even a bit scary - he saw the angels still battling Satan, although he had the assurance that God wins the battle. The Burpos waited a long time to share their story, but eventually decided to do so because Colton wanted people to know that heaven is real, that there is something beyond this life. He also wanted people to know that Jesus really loves children. In fact, Colton told his parents this so much they got tired of hearing it! But, perhaps it is a message our society desperately needs to hear. As with any private revelation, people can choose to believe or not, but I found "Heaven is For Real" very informative and that it offered one more small peek at the world that comes after this one. I love this article by Cheryl Dickow which is up today on Catholic Lane: The Dignity of Work . I know that I find great value in my work. Whether we work inside or outside the home or some combination thereof, our work has tremendous value for both us and the world. She goes on to write: "Nothing offers a fuller sense of satisfaction than a task well-performed. It doesn’t matter if that task is washing the kitchen floor, finding the best bargains at the grocery store, or guiding a classroom of middle school students towards a lesson’s objective. Inherent in who we are as humans, as Blessed John Paul points out, is the need for a person to contribute to his or her family or neighborhood or culture in a discernable way. This is what separates us from the animals but also is what gives us dignity." The Miles Christi priests offer retreats based on the Spiritual Exercises of St. Ignatius of Loyola in many areas around the country. I'm excited that two retreats will be held here in Massachusetts in the coming months. The women's retreat is in September and the men's will be held in December. he Spiritual Exercises are a weekend silent retreat with spiritual talks and time for personal meditation in silence. The spiritual conferences are preached by the priests of Miles Christi, according to the method and the principles of St. Ignatius of Loyola. The retreats will start on Friday at 4:00 pm and conclude on Sunday at 5:00 pm. Emma Smith is married to the Vice President of a private bank. They have a son, a high school senior, about to enter an Ivy League college. They live in the most fashionable section of town and vacation to exotic places. To the outside world, the Smiths have everything. Sweet Dreams is the story of redemption, forgiveness and the power of faith to turn tragedies into triumphs and transform a broken life. Sweet Dreams is available as a Kindle book. Even if you don't own a Kindle, you can get Kindle for your PC or iPad for free. The July issue of Columbia Magazine recently delved into that question. Managing editor Alton J. Pelowski offered the following statement. This is a weighty statement and requires reading through a couple times. I invite you to take the time to read and reflect on it. Because the words "freedom" and "rights" are used frequently in public debate, it is critical for us to ask what precisely is meant by freedom and what is the source of human rights. What becomes clear, then, is that the secular culture has fundamentally different assumptions about human nature than does the Catholic Church. From the secular perspective, freedom is defined primarily in terms of self-determination and choosing between various options; rights are seen simply in terms of immunity from coercion; and both religion and society itself are thought of as a voluntary associations. From the Catholic perspective, on the other hand, freedom involves the capacity to conform one's will toward what is good; rights are founded on human dignity and imply prior duties to God and to others; and our origin in God and relationship to others are inseparable from who we are as human beings . . . If freedom is reduced to simply the assertion of the will and does not acknowledge God as its source and ultimate end, then the universality of human rights is inevitably replaced by the struggle for power of the strong over the weal. In response to this false freedom that characterizes the culture of death, Catholics are called to be witnesses of the abundant life and joy that true freedom brings to the world. Our Holy Father has declared October 11, 2012 to November 24, 2013 to be a Year of Faith. Here in Springfield, MA, a conference is being held on September 22, 2012 to prepare for this coming year. Featuring such speakers as Fr. Mitch Pacwa, Sr. Jane Morrisey, Jeff Cavins and Matthew Weber, it promises to be a great event. One of the difficult things about homeschooling, or parenting in general, is accepting that our children are different from us, sometimes radically so. The educational plan that we may have dreamed of when we first started homeschooling, or the life dreams that we may have held for our children, may simply be a bad fit for our children. Often, that is because we start with what we either enjoyed, or wish that we could have done, rather than looking at the gifts and strengths and weaknesses God gave our children. This week, I've been reading High School of Your Dreams from Catholic Heritage Curricula. My kids aren't in high school yet, but I'm thinking ahead, trying to figure out what homeschooling high school might look like so that I am not having a stress attack when my son is in eighth grade and so that I will have an answer for people who question, "How on earth do you plan to homeschool high school?" Each individual is a precious and unrepeatable miracle, not because of what he does, but because of who he is: a child of God. Those who use their God-given gifts to the best of their ability, in whatever capacity, give glory to God not according to man's measure, but according to God's. I've already started praying with my children each night that they grow up to be the people God wants them to be, that they have the vocation and career that they should. God knows better than I do what is best for my children. They are His children first. I've got my latest quilt block pattern up over on my Patron Saints Quilts blog. This one is in honor of St. Brigid of Ireland and is a quilted representation of St. Brigid's Cross. Please visit: Patron Saint Quilts - St. Brigid in order to download the free pattern. Here is a great quote on appreciating the way God made us from The Cup of Our Life: A Guide to Spiritual Growth by Joyce Rupp. We aren't meant to be like everyone else, although we constantly hear this expectation. This same culture instills in us the idea that there's something wrong with us - we are flawed - if we don't measure up to certain qualifications. Maybe that's why so many people envy others' bodies, intelligence, personality traits, or talents. We tend to consistently sit in judgment upon ourselves and upon others. This is dangerous for the spiritual life . . . When we consistently compare ourselves with others, we can end up rejecting our selves - God's beloved creatures - and we follow someone else's dream instead of our own. Today give thanks to God for all you are and have.